Growing up Mexican (and of course, Catholic), meant that Christmas was a huge deal in our family. Christmas Eve would be spent with my father's side of the family and we would wait impatiently with our cousins until midnight when we could finally open up our presents. Christmas Day would be spent with my mom's side of the family after church and that never changed until I became an adult and moved away from home. After my divorce, Christmas started to become stressful, trying to figure out where our son would wake up Christmas morning and now that I'm remarried, it's a whole new challenge to try to determine if and when we can celebrate with my in-laws, my family and where my oldest son will be in all of this. Fast forward to my youngest son who was born on Christmas Eve, and you can imagine the scheduling chaos that comes up this time of year. What does this have to do with a comedy starring Vince Vaughn and Reese Witherspoon? 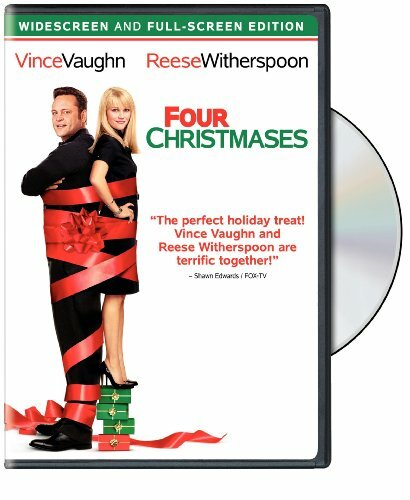 Well, it's comedy gold, in my opinion since Four Christmases tackles blended families and the holiday season with every emotion you can think of. Laughter is the best medicine and I always make sure to watch this movie before Christmas so I can remind myself that no family is perfect, and every holiday celebration is as magical as we make it, no matter what day it is on the calendar when we sit down with family. If you are a child of divorced parents or struggle with the holiday schedule between in-laws and all sets of grandparents, I highly recommend this film which will make you laugh out loud and appreciate the family you have, and the friends you've adopted who welcome you into their home as part of their family.